Beer-fueled and firework filled, the U.S.A.’s upcoming birthday has Grey Area lusting for all things Americana. 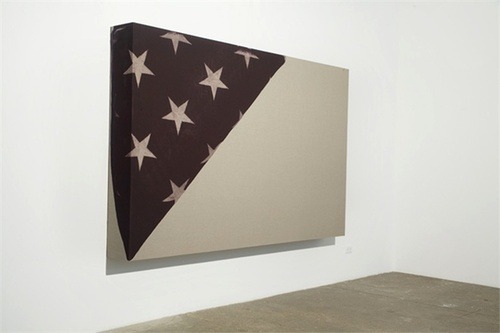 For our collection, artist and designer Derek Brahney and our friend Ray Geary found inspiration in the iconic design of the American flag, so we decided to do a little exploration of our own into the history of the stars and stripes in contemporary art. The first name that came to mind was Jasper Johns and his seemingly endless renditions of the classic American symbol that now populate museums across the globe. 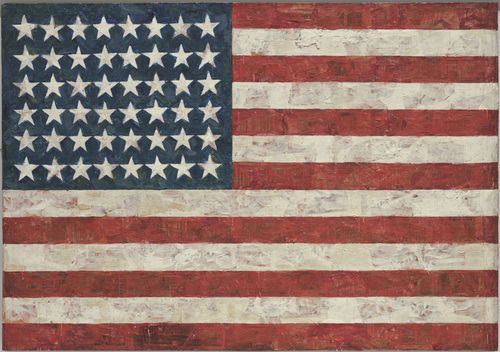 Render in encaustic, newspaper scraps and bright painterly swipes, Johns’ Flag was one of the first examples of Abstract Expressionism where the subject was answered with the diverse affiliations of an universal icon. 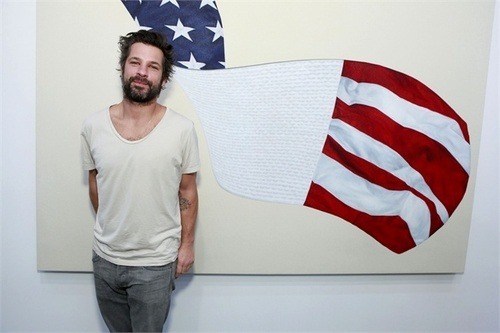 For John’s, the flag is divorced from its connotations both historical and political and is simply used as a universally recognized pattern, but for other artists the flag is specifically implemented in order to convey a more politically driven message. For a contemporary example, we looked no farther than Dave Cole who we spotted this year at the 2013 Armory Show with his piece Flags of the World. 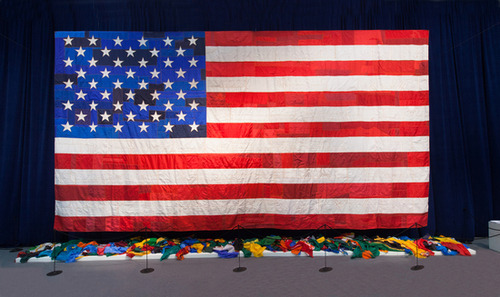 Made up of the UN’s 192 flags from across the world which Cole cut up and collaged to create an imposing American flag, Cole’s piece sends a strong political message regarding the contentious power relationship between the U.S. and the UN. 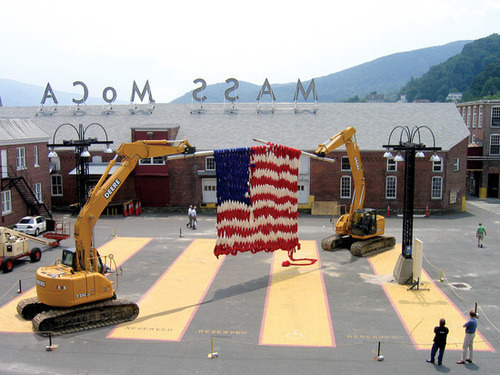 Like Johns, the flag is a reoccuring symbol across Cole’s work, appearing in his large scale installation Knitting Machine at Mass MoCA in 2005, which resulted in a 30 foot long, knit American Flag. 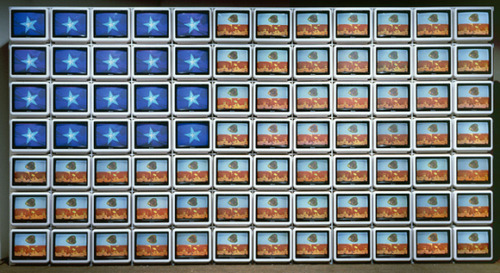 Other famous politically-minded pieces include Korean artists Nam June Paik’s Video Flag Z (1968) which brought the stars and stripes to life with a wall of glowing tv screens. In recent years, flags have appeared in the pieces of some of our favorite working artists like Nate Lowman and Aaron Young, who use the classic pattern as a vehicle for larger discussions about American culture and the country’s future. In his most recent show ”I wanted to be an artist but all I got was this lousy career” which ran this past winter, Lowman created a ginormous patriotic scent tree that hinted at the larger symbolism of his towering wall of seasonal inspired shapes. So despite its cliches and the mountains of products that follow on its heels, we must agree with Young and say that the stars and strips have their appropriate time and place. Lucky for us with Fourth of July and a weekend of sparklers and barbecue upon us, we can’t think of a better time to show off your flag swag and celebrate contemporary arts love affair with red, white and blue. Check out some of our picks for patriotic paraphernalia. The American flag lapel pin is a symbol of unfaltering patriotism that has been worn by presidents and statesmen since the mid-century. To reflect the global economy of today, artist and illustrator Derek Brahney decided to create the Dependence Pin, an updated, more accurate version of the iconic pin. Made just in time for the Fourth, you can celebrate our dependence on overseas manufacturing on Independence Day. Shimmering in stainless steel, sculptor George Sanchez Calderon’s Americana is a desktop tribute to his original sculpture which inhabits the lawn of the St. Regis Bal Harbour Resort—the site where the “Americana” hotel once proudly stood. Artist Ray Geary pays tribute to America’s affair with the pharmaceuticals industry with a playful resin and pill rendition of the flag’s bold stripes. Suspended in space, Geary’s cheeky Pill Flag provides a way for one to experience the iconic pattern from all conceivable angles.